This article is about a Commandant of the Marine Corps. For the 1876 Medal of Honor recipient, see Emile Lejeune. John Archer Lejeune (/ləˈʒɜːrn/; January 10, 1867 – November 20, 1942) was a United States Marine Corps lieutenant general and the 13th Commandant of the Marine Corps. 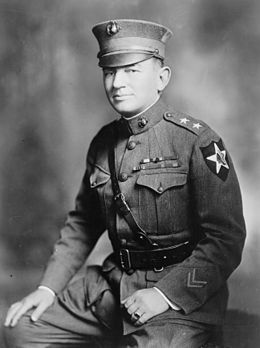 Lejeune had nearly 40 years service in the Marine Corps including commanding the U.S. Army's 2nd Division during World War I. His service with the Marine Corps after he retired was as the 5th Superintendent of the Virginia Military Institute. Pointe Coupee Parish, Louisiana, U.S.
Arlington National Cemetery, Virginia, U.S.
Marine Corps Base Camp Lejeune in North Carolina was named in his honor during World War II. Lejeune is often referred to in the present day as being the "greatest of all Leathernecks" and the "Marine's Marine." Lejeune was born on January 10, 1867 at the Old Hickory Plantation near Lacour, Louisiana in Pointe Coupee Parish. He was the son of Confederate States Army Captain Ovide Lejeune. He attended the preparatory program at Louisiana State University in Baton Rouge from September 1881 to April 1884, leaving to prepare for the entrance exam for the U.S. Naval Academy. Subsequently, he secured an appointment as a midshipman at the United States Naval Academy, from which he graduated in 1888, ranking second academically in his class of thirty-two midshipmen. At the completion of a two-year cruise as a midshipman, he was appointed to Naval Engineering, but was desperate to join the Marine Corps. Exhausting all conventional channels, he contacted his senator and eventually the Secretary of the Navy who arranged his appointment to the Marine Corps. He was commissioned a second lieutenant in the Marine Corps on 25 July 1890. His immediate family was very involved with the Marine Corps particularly during World War II in the fight against the Axis powers of Nazi Germany and Japan. His daughter, Eugenia Lejeune, and his grandson, James Blair Glennon Jr., both served with the Corps during the war and after. His granddaughter, Jeanne Glennon Hull, served in the Navy's WAVES and was married to Lt. Col. William Frederick Harris in 1946. After receiving his Marine Corps commission, Lejeune was assigned to Marine Barracks, New York on 31 March 1890 for Marine Corps "indoctrination and instruction". Afterwards, he reported for duty to the Marine Barracks, Norfolk, Virginia, on 3 November 1890. While in Norfolk, he met Ellie Harrison Murdaugh; they were engaged just before he began his first tour of sea duty. From 1 October 1891 to 28 July 1893, Lejeune served on board USS Bennington and was promoted to first lieutenant on 26 February 1892. On 28 August 1893, he was assigned to the Norfolk Marine Barracks, where he served until 31 July 1897. While stationed in Norfolk this second time, he married Miss Murdaugh on 23 October 1895. On 2 August 1897, Lejeune assumed command of the Marine Guard of the USS Cincinnati, where he served throughout the Spanish–American War. On the morning of 9 August 1898, he commanded the approximately 30-man landing party at Cape San Juan, Puerto Rico that covered the withdrawal of 35 U.S. Navy bluejackets from USS Amphitrite and 60 civilian refugees from the town of Fajardo that had been quartered at the Cape San Juan Light that the sailors had defended against a force of approximately 200 Spanish Army troops and civil guard the previous night during the Battle of Fajardo. He was reassigned from Cincinnati on 17 February 1899, and on 18 February 1899, joined the USS Massachusetts to command the Marine Guard on board. He was promoted to captain on 3 March 1899 and left his position on the Massachusetts on 10 May 1900. From 3 July 1900 to 12 November 1900, Captain Lejeune was assigned to recruiting duty at Boston, Massachusetts. On November 22, 1900, he reported at the Marine Barracks, Pensacola, Florida, to command a Marine Detachment there. From 12 January 1903 to 21 January 1903, Captain Lejeune was on duty at the Norfolk Barracks, he was en route to duty at New York City on 26 January 1903. He was promoted to Major on 3 March 1903 and was on duty assigned to Headquarters Marine Corps in Washington, D.C. from 15 May 1903 to 8 August 1903. On 8 August 1903, Major Lejeune was assigned to USS Panther to command the Marine Battalion on board that vessel, joining the ships company 16 August 1903. On 23 October 1903, the battalion, with Lejeune in command, was transferred to USS Dixie. From 16 December 1903 to 21 December 1904, Major Lejeune was on shore duty on the Isthmus of Panama in command of this battalion, leaving there on the latter date on board USS Yankee. From 27 January 1905 to 20 May 1906, Lejeune served at the Marine Barracks, Washington, D.C. He then returned to Panama in command of a battalion of Marines from 29 May to 6 July 1906, the battalion being transported both ways on board USS Columbia, returning to Washington Marine Barracks. On 29 March 1907, Major Lejeune was detached from command of the Washington Barracks and ordered to the Philippines. His family—his wife and three daughters accompanied him on this overseas duty. Arriving in the Philippines on 2 May 1907, Lejeune assumed command of the Marine Barracks and Naval Prison, Navy Yard, Cavite, on 6 May 1907. He assumed command of the First Brigade of Marines on 15 June 1908 and was promoted to lieutenant colonel on 13 May 1909. He was detached on 8 June 1909 and ordered to return to the United States. He then attended the U.S. Army War College, graduating in 1910. The senior officers of the 1st Marine Brigade photographed at Veracruz in 1914. Front row, left to right: Lt. Col. Wendell C. Neville; Col. John A. Lejeune; Col. Littleton W. T. Waller, Commanding; and Maj. Smedley Butler. Lieutenant Colonel Lejeune embarked on board USS Ohio on 26 May 1912 with the Second Regiment, First Provisional Brigade Marines for Cuba. He disembarked at Guantanamo Bay, Cuba, on 8 June 1912 and was in command of the District of Santiago from 9 June, to 14 July 1912. On 15 July 1912, Lejeune embarked on board USS Prairie and sailed for Colón, Panama. July 18–29, 1912 was spent at Camp Elliott, Panama. The Marine Corps Association was founded on April 25, 1911 at Guantanamo Bay by the officers of the 1st Provisional Marine Brigade, under command of Colonel Littleton W. T. Waller. Although the 1st Provisional Marine Brigade disbanded shortly after, the MCA remained active. Two years later, again at Guantanamo Bay, officers of the 2d Provisional Marine Brigade, commanded by Colonel Lincoln Karmany, formally organized the Marine Corps Association. Colonel Karmany appointed then-Lt. Colonel John A. Lejeune as its first head of the executive board. After returning to the United States, Lejeune was again called upon for expeditionary duty. He sailed from Philadelphia, 20 February 1913 as second in command of the First Regiment, Second Provisional Brigade Marines and disembarked 27 February 1913, at Guantanamo Bay, Cuba. Then-Lt. Colonel Lejeune became the first head of the Marine Corps Association with the goal of professional advancement among Marines. He returned to Philadelphia on board USS Prairie on 2 May 1913. On 27 November 1913, Lejeune sailed from New York with the 2nd Advanced Base Regiment, his ultimate destination Veracruz, Mexico, but returned to the United States to receive his promotion to colonel on 25 February 1914. Colonel Lejeune and his unit eventually landed in Mexico on 22 April 1914 and participated in the United States occupation of Veracruz. He returned home in December 1914, this time to report to Marine Corps Headquarters in Washington, D.C., to become the Assistant Commandant of the Marine Corps to Major General George Barnett, Commandant of the Marine Corps. He was promoted to brigadier general on 29 August 1916. Lejeune at the front in France. With the April 1917 American entry into World War I, Lejeune assumed command of the newly constructed Marine Barracks, Quantico, Virginia; however, his overseas service was inevitable, and in June 1918, he arrived at Brest, France. He was promoted to major general on 1 July 1918. Upon reporting to General John Joseph "Blackjack" Pershing, Commander-in-chief (CinC) of the American Expeditionary Force (AEF) on the Western Front, he was assigned to command a brigade of the 32nd Division but later assumed command of the 4th Marine Brigade, part of the 2nd Division, immediately following the attack of the division in the Battle of Soissons. On 28 July 1918, Major General Lejeune assumed command of the 2nd Division and remained in that capacity until August 1919, after the war, when the division was demobilized. He was the second Marine officer to hold an Army divisional command (Marine Brigadier General Charles A. Doyen had previously commanded the division for two weeks), and following the Armistice with Germany in November 1918 he led his division in the march into Germany. Lejeune commanded the US Army 2nd Division during the victorious action at the battle of St Mihiel. Lejeune emphasized tightly coordinated action that emphasized extensive rehearsal and disciplined artillery gunnery. This discipline enabled infantry elements to follow closely behind barrages that would otherwise be far too risky. This "leaning on the artillery" meant that the enemy faced direct assault while still reverting from the shock of a bombardment. Lejeune stated his philosophy as "The key to combat effectiveness is unity — an esprit that characterizes itself in complete, irrevocable, mutual trust. Now my infantry trusts my artillery and engineers, and my artillery and engineers know this so they will go through hell itself before they let down the infantry. My infantry believe that with such support they are invincible-and they are." Marshal Petain praised Lejeune as "a military genius who could and did do what the other commander said couldn't be done." During the war, he was recognized by the French government as a strategist and leader, as evidenced by the Legion of Honor, and the Croix de guerre bestowed upon him by France. The C-in-C of the AEF, General Pershing, awarded Lejeune the U.S. Army's Distinguished Service Medal. The U.S. Navy's Distinguished Service Medal was conferred upon him when he returned to the United States following the occupation of Germany. Lejeune with his insignia of commander in the French Légion d'honneur. In October 1919, he again was appointed Commanding General, Marine Barracks, Quantico, Virginia. Lejeune was appointed as Major General and Commandant of the Marine Corps on 1 July 1920. Subsequent to that time, he left his headquarters at Washington several times for tours of inspection in Haiti, Santo Domingo, Cuba, Puerto Rico, to the West Coast and elsewhere. During his service as Major General Commandant, Lejeune presided over what is known as the first enlightenment of the Marine Corps. Lejeune directed intelligence gathering operations in the Pacific in the early 1920s, and drove changes in the organization, training, education, and equipping of Marines, thus transforming them from 19th century colonial naval infantry into a combined arms amphibious force needed to prevail in World War II. Upon the expiration of his second term as Commandant, Lejeune indicated his desire not to retire from the Marine Corps, but was relieved as Commandant in March 1929. The Marine Corps League is the only Congressionally chartered United States Marine Corps-related veterans organization in the United States. Its Congressional Charter was approved by the 75th U.S. Congress and signed by President Franklin D. Roosevelt on August 4, 1937. The organization credits its founding — in 1923 — to legendary Marine Corps Commandant John A. Lejeune. On 10 November 1929, Lejeune retired from the Marine Corps after thirty-nine years of service in order to accept the position of Superintendent of the Virginia Military Institute (VMI) in Lexington, Virginia. Lejeune served as the Institute's 5th Superintendent for eight years until October 1937, when he retired for the second and final time. In 1930 Lejeune was elected as an honorary member of the Virginia Society of the Cincinnati. In September 1939, when Hitler's legions invaded Poland he wrote to Thomas Holcomb, then the current Commandant of the Marine Corps, and volunteered to serve once more given his alarm over the crisis in Europe. The offer was gently declined given his age. In February 1942, he was advanced to the rank of lieutenant general on the Marine Corps retired list. Lejeune died 20 November 1942 in the Union Memorial Hospital, Baltimore, Maryland, and was interred in the Arlington National Cemetery with full military honors. On November 10, 1775, a Corps of Marines was created by a resolution of Continental Congress. Since that date many thousand men have borne the name "Marine". In memory of them it is fitting that we who are Marines should commemorate the birthday of our corps by calling to mind the glories of its long and illustrious history. The record of our corps is one which will bear comparison with that of the most famous military organizations in the world's history. During 90 of the 146 years of its existence the Marine Corps has been in action against the Nation's foes. From the Battle of Trenton to the Argonne, Marines have won foremost honors in war, and in the long eras of tranquility at home, generation after generation of Marines have grown gray in war in both hemispheres and in every corner of the seven seas, that our country and its citizens might enjoy peace and security. In every battle and skirmish since the birth of our corps, Marines have acquitted themselves with the greatest distinction, winning new honors on each occasion until the term "Marine" has come to signify all that is highest in military efficiency and soldierly virtue. This high name of distinction and soldierly repute we who are Marines today have received from those who preceded us in the corps. With it we have also received from them the eternal spirit which has animated our corps from generation to generation and has been the distinguishing mark of the Marines in every age. So long as that spirit continues to flourish Marines will be found equal to every emergency in the future as they have been in the past, and the men of our Nation will regard us as worthy successors to the long line of illustrious men who have served as "Soldiers of the Sea" since the founding of the Corps. On November 10, 2005, the United States Postal Service issued the Distinguished Marines stamps in which Lejeune was honored. On November 10, 2000, a life-sized bronze statue of Lejeune was unveiled on the grounds of the Pointe Coupee Parish Courthouse in New Roads, Louisiana. Patrick F. Taylor, chairman and CEO of Taylor Energy Company, along with the retired Marine Corps Major General Ronald G. Richard (former commanding general of Marine Corps Base Camp Lejeune) were in attendance. Taylor, who financed the Lejeune statue project, joined the Marine Corps Officer Training program as a student at Louisiana State University, but a heart problem kept him from receiving his commission. Taylor commissioned sculptor Patrick Dane Miller to fashion it to be historically accurate. Statues of Lejeune also stand outside the National Museum of the Marine Corps in Virginia, in the center of the traffic circle aboard MCB Camp Lejeune NC, outside of Lejeune Hall at the United States Naval Academy, outside of Lejeune Hall on MCB Quantico, VA, and the Louisiana War Memorial in downtown Baton Rouge, Louisiana next to the destroyer USS Kidd. ^ White Hoffman, Nancy Lee (February 2009). "Corps Album; A tribute to Women in the Corps". Leatherneck Magazine. Quantico, Virginia: Marine Corps Association (February 2009): 22. Retrieved April 4, 2009. ^ Jackson, Carol. "Why Does WUNC Pronounce 'Camp Lejeune' With An 'R'?". WUNC. Retrieved July 27, 2014. ^ The Curatorial Staff. "This Month in History – January". Louisiana Secretary of State. Retrieved May 9, 2007. ^ Harrelson, Randy, and Costello, Brian (2012). New Roads and Old Rivers: Louisiana's Historic Pointe Coupee Parish. Baton Rouge: Louisiana State University Press. p. 117. ^ Taylor, Cpl Patrick F., USMC. "Lieutenant General John Archer Lejeune Marker". The Historical Marker Database. Retrieved February 7, 2009. ^ a b c Asprey, Robert B. (April 1962). "John A. Lejeune: True Soldier". Marine Corps Association & Foundation. ^ "Shadow box". marines.togetherweserved.com. Retrieved May 26, 2018. ^ "Obituaries". April 22, 2008. ISSN 0190-8286. Retrieved May 26, 2018. ^ Pearson, Richard (March 25, 1992). "FRIEDRICH HAYEK, 92, DIES". Washington Post. ISSN 0190-8286. Retrieved May 26, 2018. ^ "About the Marine Corps Association". MCA. Archived from the original on October 11, 2007. Retrieved October 16, 2007. ^ L., Bartlett, Merrill (1991). Lejeune : a marine's life, 1867-1942. Columbia, S.C.: University of South Carolina Press. ISBN 0872497712. OCLC 23939712. ^ Lejeune, John (October 6, 2008). "Marine Corps Order No. 47 (Series 1921)" (PDF). Archived from the original (PDF) on March 4, 2009. Retrieved November 6, 2008. ^ "General John A. Lejeune's Birthday Message" (PDF). October 27, 2004. Archived from the original (PDF) on November 12, 2008. Retrieved November 6, 2008. ^ "Welcome to Pointe Coupee Parish". Pointe Coupee Parish. Retrieved May 10, 2007. ^ "Photo Gallery: Unveiling". LSU Today (18, number 16). November 30, 2001. Archived from the original on July 10, 2003. Retrieved May 10, 2007. ^ Cooke, Jennifer (April 1, 2000). "Always a Marine" (PDF). The Advocate. Archived from the original (PDF) on October 25, 2007. Retrieved October 4, 2007. Bates, Ralph. Preston, Mary Ann; Bates, Lyn (eds.). A Marine Called Gabe. Ralph Stoney Bates Sr. Retrieved May 9, 2007. "Biography of Lieutenant General John Archer Lejeune (1867–1942)". Louisiana's Military Heritage: Sons & Daughters of the State. USS Kidd Veterans Memorial, Louisiana Naval War Memorial Commission. Archived from the original on September 30, 2007. Retrieved May 9, 2007. "Major General John A. Lejeune Birthday Message". Customs and Traditions. United States Marine Corps History Division. 1921. Archived from the original on July 22, 2011. "Major General John Archer Lejeune, USMC". Who's Who in Marine Corps History. United States Marine Corps History Division. Archived from the original on October 7, 2010. Retrieved March 30, 2011. "John A. Lejeune, Class of 1888". United States Naval Academy alumni. United States Navy. Retrieved March 18, 2016. Allan Reed Millett; Jack Shulimson, eds. (2004). Commandants of the Marine Corps. Annapolis, Maryland: Naval Institute Press. pp. 194–213. ISBN 978-0-87021-012-9. Wikimedia Commons has media related to John A. Lejeune. Bartlett, LtCol Merrill L., USMC (Ret), compiler (1988). John Archer Lejeune, 1869-1942: Register of His Personal Papers (PDF). History Division, United States Marine Corps. Archived from the original (PDF) on January 31, 2017. Retrieved December 31, 2016. Bartlett, Merrill L. (1996). Lejeune: A Marine's Life, 1867–1942. Naval Institute Press. ISBN 0-87249-771-2. Brent, P.T. (April 2008). "Lejeune, Lejern (How to say it)". Leatherneck Magazine. Archived from the original on June 4, 2008. Irwin, Manley R. (2004). "Lejeune and Denby: Forging a Marine Corps Doctrine". Marine Corps Gazette. Lejeune, John A. (1930). The Reminiscences of a Marine. Dorrance and Company, Inc. ISBN 0-405-11860-0.